Only 3.000 decks printed! Get them fast to not be left without! 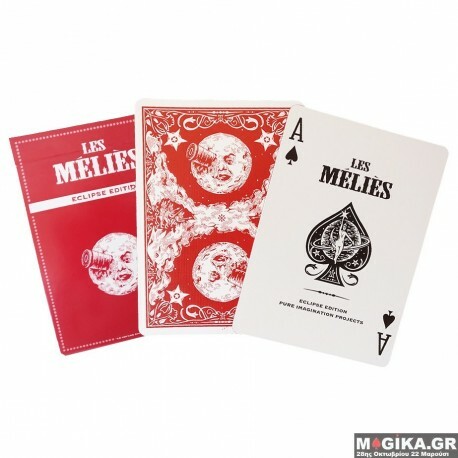 The latest edition of the Les Méliés series of playing cards by Derek Mckee and Michael Blau pays tribute to the iconic film "A Trip to The Moon" directed by the French filmographer and magician George Méliés. While the deck features the same intricately designed back, the Les Méliés Red Eclipse edition includes an updated tuck box. Most importantly, this deck encapsulates many secrets and features, that will enable you to captivate your audience and push the boundaries of their imaginations. We encourage you to discover the special features on your own. The previous version of the Melies, literally flied of the shelves, becoming quickly a “rare” deck that is sold at high prices. We are sure that the same will be for this new edition. Don’t miss out on the chance to own this unique deck, that value of which is destined to re-evaluate over time.